It’s not often that I go overboard for a particular restaurant. Having eaten in so many, it takes something really special to get me going. 18.10.2015 - Here is just such a place. Down in the south of the island is a small seaside village by the name of Tajao, no doubt unknown to the thousands of tourists battling their way along the TF1. However, turn off said motorway, cruise down towards the sea, and you will end up in a small fishing village, snoozing quietly in the midday sun. Nothing much going on down by the harbour, but a number of small seafood restaurants and bars in the main street proclaim the sale of fresh fish. Passing them by, we search out our target. 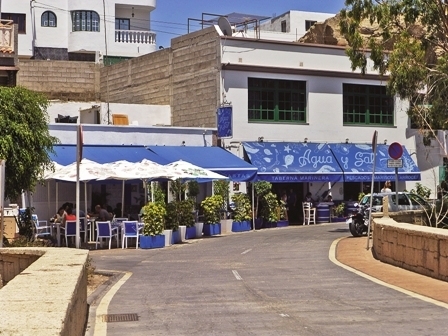 We have to make a right turn, twist between some houses in the narrow road, and suddenly, we spy parked cars, people milling about, and a picture-perfect vision of a seafood restaurant, all done out in blue and white. Where have all these people come from? It is Monday lunchtime, and other places are feeling the pinch. Not so here; there seems to be a queue! And it is very hot! But no sooner have we goggled at the amazing fresh fish display than we are whisked away to a nice inside table. Bread and three sauces (€2.00) are swiftly put before us, and a large bottle of water is ordered. We draw breath and look around us. This place is packed! Every table inside is taken, all of those on the roadside terrace are taken, and the waiters are flying about, clearly well trained and motivated. The water arrives, and we are invited to visit the two large displays and make our choices. I can only think that every fish and shellfish that you can get on the island is available, so the choice is difficult. A display of plump scallops in their shell look inviting, as do a mound of camarones, those tiny pink shrimps that you can almost eat whole. There are piles of fresh mussels, and I saw that they were popular at the table next to us, being served in a huge skillet with a garlic and tomato sauce, extra bread being called for to mop up the juices. A big platter of seafood salad beckoned to me. It contained tuna squid, sardine, prawn, celery, green and red peppers, tomato and much more besides. The lady in charge was heaping a plate for me and I had to plead for a small portion (€4.50). We cannot avoid choosing those camarones, so a full plate of these was taken (€8). A bowl between us of chipirones, small squid (and would we prefer it fried or grilled?) came in a delightfully light batter, so light that it was almost not there. And so tender, just quickly flash fried. They really do know how to cook fish here. It was sold by weight, and ours came to €9, more than enough for two persons. The rush was easing a bit as we called for our bill, which tallied all of €27.44, including IGIC: so cheap that I thought that they must have missed something off, but no, even my spouse’s glass of wine had been included. Prices, quality and quantity like this in the South? Unheard of! I thought we must have been transported back in time to the North! We can’t wait for an excuse to cross the island again. This place goes straight into my top ten. Calle Callao Hondo 22, Tajao, Arico, Tenerife. Produced with news.CMS in 0,0959 seconds.